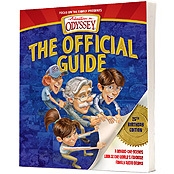 What can we expect to see in “Adventures in Odyssey: The Official Guide, 25th Birthday Edition“? We’re glad you asked. As we approach the release of this exciting book, you can visit our product page and access high-resolution cover images, details, and ordering links. It’s a book you won’t want to miss!